It is late morning. The sky is overloaded with clouds. Hopes of a down pour and relief from heat take wings. A cool breeze shakes the tree tops. 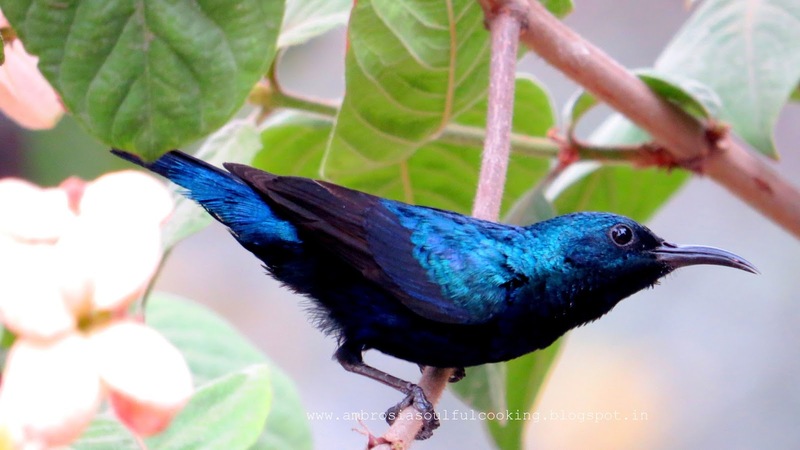 A purple sunbird settles on a Mussaenda branch and raises alarm. He has spotted our cat in deep slumber under a fish tail palm, camouflaged in the dry vegetation. Soon we discover the reason of this alarm. One of his baby birds has just left the nest. It has taken its maiden flight and is perched in the lower branches of the Neem tree. “Cheep”, “Cheep” goes the baby bird. The female bird swoops down midair, catches an insect and feeds the baby. Soon the male joins his partner and they take turns to feed the fledgling. For dinner, a bread is being baked. 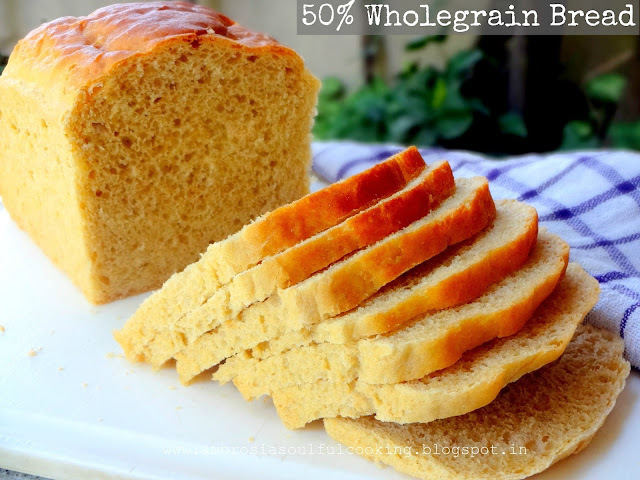 50% wholegrain bread is going through bulk fermentation. It is an easy to bake bread that rises well and has a great crumb. Whisk together first six ingredients in a deep bowl. Stir honey in 1 ¼ cup warm water. Add this water to flour mix and stir. Keep adding more water till you get a shaggy dough. Transfer the dough to a kneading plate or a counter. Knead for 8 to 10 minutes. By the end of kneading, the dough should be slightly sticky, elastic and soft. Form a ball and transfer to a greased bowl. Turn the dough around so that it is evenly coated with oil. Keep in a warm place to rise until double or for 1 hour. Grease one 8 x 4 x 4 inch loaf pan. Punch dough and knead it again for a minute or two. Roll out the dough into a rectangle not bigger than the width of the pan you are using. Roll the dough towards you, tightly. Pinch seams to seal. Place the roll in the greased loaf tin with the seam side down. Cover and keep it to rise for 1 hour in a warm place or until it crests above the rim of the pan. Bake in the preheated oven at 190 degrees C for 30 to 35 minutes or till the top turns brown and the bottom of the pan sounds empty when tapped. If the loaf is browning too quickly, tent the loaf loosely with a foil. Hi Namita, thanks for the lovely recipe, I have a bread machine, and need to set it on 1.5,2 or 2.5 lb. Could you please tell me what is the yield of this bread? Wow, what a great texture your bread has! Love the sunbird, such a delicate, graceful animal. Lovely Loaf. Which instant yeast do you use and where you do buy it from ? Thanks for the lovely posts and the tempting pictures of the serenity around you. Hello Yamini, Thank you for liking my post. I buy yeast from my departmental store. My brand is "Four Seasons". I have also used another brand - "Prime". Hope you find the yeast soon and enjoy baking bread. 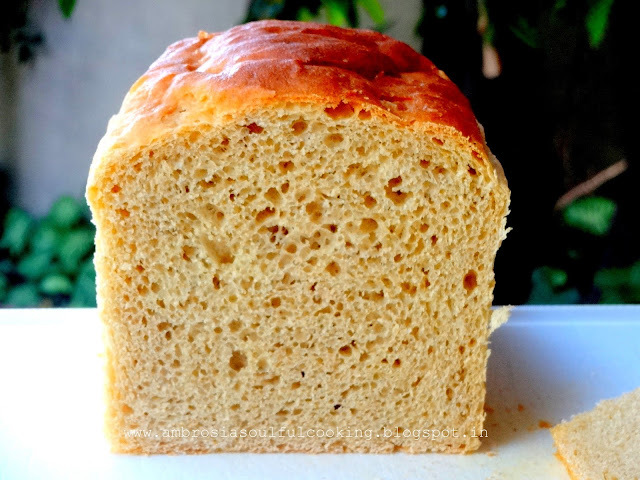 hi namita tiwari..your recipes are always so lovely to try..for this particular bread what can be used instead of honey..I have asked you earlier also but have forgotten!!!oops!!! !